That genocide was carried out at extermination camps using tools of mass murder, such as gas chambers. The methodologies of Holocaust deniers have been criticized as being based on a predetermined conclusion that ignores the overwhelming historical evidence to the contrary. 3 Himmler's speeches and "Ausrottung"
The claims of deniers are grounded in flawed research, biased statements, and, in some cases, deliberately falsified evidence. Courts of law have also rejected Holocaust denial claims (see Fred A. Leuchter and David Irving) and laws against holocaust denial have been passed in 14 European countries. The Nizkor Project, a group opposed to Holocaust denial claims, analyzes these claims for instances where the evidence used by Holocaust deniers has been altered or manufactured. Many historians, such as Ian Kershaw, Raul Hilberg, and Martin Broszat, accept that no document exists showing that Hitler ordered the Holocaust. However, other evidence indicates that Hitler knew about and ordered the genocide. Statements from Adolf Eichmann, Joseph Goebbels, and Heinrich Himmler also indicate that Hitler orchestrated the Holocaust and statements from Hitler himself reveal his genocidal intentions toward Jewry. In a letter dated 1919 Hitler mentions that an "unshakable" aim of a strong national government must be "the removal of the Jews". If at the beginning of the war and during the war twelve or fifteen thousand of these Hebrew corrupters of the people had been held under poison gas, as happened to hundreds of thousands of our very best German workers in the field, the sacrifice of millions at the front would not have been in vain. Today I want to be a prophet once more: if international Jewry succeeds in plunging the nations into another world war, the result will not be the Bolshevization of the earth, and thereby the victory of Jewry, but the destruction of the Jewish race in Europe! ... [T]he war will not end as the Jews imagine it will, namely with the uprooting of the Aryans, but the result of this war will be the complete annihilation of the Jews. Now for the first time they will not bleed other people to death, but for the first time the old Jewish law of an eye for an eye, a tooth for a tooth, will be applied. And – world Jewry may as well know this – the further these battles [of the war] spread, the more anti-Semitism will spread. It will find nourishment in every prison camp and in every family when it discovers the ultimate reason for the sacrifices it has to make. And the hour will come when the most evil universal enemy of all time will be finished, as least for a thousand years. None of the Führer's prophetic words has come so inevitably true as his prediction that if Jewry succeeded in provoking a second world war, the result would be not the destruction of the Aryan race, but rather the wiping out of the Jewish race. This process is of vast importance, and will have unforeseeable consequences that will require time. But it can no longer be halted. It must only be guided in the right direction. In a draft of an internal memorandum, dated 18 September 1942, Reichsfuhrer SS Heinrich Himmler wrote that "in principle the Fuehrer's time is no longer to be burdened with these matters;" the memorandum goes on to outline Himmler's vision, including "The delivery of anti-social elements from the execution of their sentences to the Reich Fuehrer of SS to be worked to death. Persons under protective arrest, Jews, Gypsies, Russians and Ukrainians, Poles with more than 3-year sentences, Czechs and Germans with more than 8-year sentences according to the judgement of the Minister of Justice [Thierack]. First of all, the worst anti-social elements amongst those just mentioned are to be handed over; I shall inform the Fuhrer of this through Reichsleiter Bormann." Nevertheless, and in contrast to the T4 euthanasia program, no document written or signed by Hitler ordering the Holocaust has ever been found. Deniers have claimed that this lack of order shows genocide was not Nazi policy. When David Irving unsuccessfully sued Deborah Lipstadt for libel, he considered that a document signed by Hitler ordering the 'Final Solution' would be the only convincing proof of Hitler's responsibility, yet was content to accuse Winston Churchill responsible for ordering the assassination of General Sikorski, despite having no documentary evidence to support this claim. Mr Justice Gray concluded that this was a double standard. Historians have documented evidence that as Germany's defeat became imminent and the Nazi leaders realized they would most likely be captured and brought to trial, great effort was made to destroy all evidence of mass extermination. In the spring of 1942, Heinrich Himmler ordered all traces of murdered Russian Jews and prisoners of war to be removed from occupied territories of the Soviet Union. As one of many examples, the bodies of the 25,000 mostly Latvian Jews whom Friedrich Jeckeln and the soldiers under his command had shot at Rumbula (near Riga) in late 1941 were dug up and burned in 1943. In mid-1942, SS-Obergruppenführer Reinhard Heydrich, through SS-Gruppenführer Heinrich Mueller, Chief of the Gestapo, ordered SS-Standartenführer Paul Blobel in Sonderaktion 1005 to remove all traces of the mass executions in the East carried out by the Einsatzgruppen. After Blobel and his staff developed a special incineration process, destruction of evidence at Belzec and Sobibor followed in late 1942. In February 1943, Heinrich Himmler personally visited Treblinka and ordered the commandants to destroy records, crematoria, and other signs of mass extermination. I also want to refer here very frankly to a very difficult matter. We can now very openly talk about this among ourselves, and yet we will never discuss this publicly. Just as we did not hesitate on June 30, 1934, to perform our duty as ordered and put comrades who had failed up against the wall and execute them, we also never spoke about it, nor will we ever speak about it. Let us thank God that we had within us enough self-evident fortitude never to discuss it among us, and we never talked about it. Every one of us was horrified, and yet every one clearly understood that we would do it next time, when the order is given and when it becomes necessary. Historian Peter Longerich states that Hitler "...avoided giving a clear written order to exterminate Jewish civilians." Wide protest was evoked when Hitler's authorisation of the T4 program became public knowledge in Germany, and he was forced to put a halt to it as a result (nonetheless it continued discreetly). This made Hitler realise that such undertakings must be done secretly in order to avoid criticism. Critics also point out that if Hitler did sign such an order in the first place, it would have been one of the first documents to be destroyed." Felix Kersten wrote in his memoirs that after a discussion with Himmler, the SS-Reichsführer revealed that the extermination of the Jews was Hitler's express order and had indeed been delegated to him by the Führer. Many statements from the Nazis from 1941 onwards addressed the imminent extermination of the Jews. As the affairs now stand, there are no objections against doing away with those Jews who are not able to work, with the Brack remedy. March 27, 1942: A judgment is being visited upon the Jews that, while barbaric, is fully deserved by them. The prophecy which the Führer made about them for having brought on a new world war is beginning to come true in a most terrible manner. One must not be sentimental in these matters. If we did not fight the Jews, they would destroy us. It's a life-and-death struggle between the Aryan race and the Jewish bacillus. In November 1941, Goebbels published an article "The Jews are to blame" which returned to Hitler's prophecy of 1939 and stated that world Jewry was suffering a "gradual process of extermination". On March 13, 1945, Goebbels wrote in his diary that the "rest of the world" should follow Germany's example in "destroying the Jews", he wrote also about how the Jews in Germany at that point had been almost totally destroyed. This diary contains numerous other references to the mass extermination of Jews, including how "tens of thousands of them are liquidated" in eastern occupied territory, and that "the greater the number of Jews liquidated, the more consolidated will the situation in Europe be after this war." When speaking about this document under oath, David Irving is quoted as saying "There is no explicit reference...to the liquidation of Jews" and critics of Holocaust denial consequently state that it is dishonest to say such a thing when it is entirely contradicted by the diary of one of Hitler's closest associates. David Cole has previously stated that those who consider themselves revisionists have yet to provide an adequate explanation of this document. I never saw a written order, Herr Hauptmann. All I know is that Heydrich said to me: "The Führer has ordered the physical extermination of the Jews." He said that as clearly and surely as I'm repeating it now. Critics state that Eichmann gives a virtually identical account of this in his memoirs, and state that it is also asserted that Eichmann never even asked for a written order, on the basis that "Hitler's wish as expressed through Himmler and Heydrich was good enough for him". Eichmann's memoirs were recorded by Willem Sassen before he was captured, and Eichmann's lawyer tried to prevent them from being presented as evidence to avoid any detriment against his case. In a speech, David Irving states that Heydrich told Eichmann, "The Führer has given the order for the physical destruction of the Jews". Irving admits that this contradicts his view that "Hitler wasn't involved", but explains it by suggesting that a completely different meaning can be construed, i.e. "the extirpation of Judaism" as opposed to the physical destruction of Jews if one changes "just one or two words". Critics of this view state that historians should not change words if their documents contradict their claims, and consequently point out five instances where Eichmann unambiguously states "physical extermination" during his interrogation. Report to Hitler detailing the executions of prisoners. Congruent with the evidence that shows Hitler was responsible for the order to kill Jews, there is also evidence that shows he was made aware of the process. 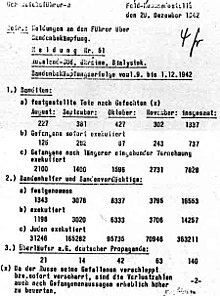 In December 1942 Hitler received a document from Himmler entitled, "Report to the Führer on Combating Partisans", stating that 363,211 Jews had been killed by Einsatzgruppen in August–November 1942. This document was marked "Shown to the Führer". As noted by Peter Longerich, Gestapo Chief Heinrich Müller sent a telegram on August 2, 1941, ordering that "especially interesting illustrative" material should be sent to Berlin because, "the Führer should be presented with continuous reports on the work of Einsatzgruppen in the East from here". Because of this, critics of Holocaust denial reject the suggestion that Hitler lost interest in anti-semitism after attaining power in 1933, finding it "hard to believe that a man who had lost his anti-semitism was so interested in situational reports on the killings of Jewish men, women and children while engaged in a war." An excerpt of this speech where Himmler discusses the ongoing extermination of the Jews. Detail of a photograph taken at Auschwitz between February 9 and 11, 1943, showing the gas chamber at Crematorium Complex II, then under construction. Some of the apertures through which Zyklon B was inserted into the gas chamber are visible. There have been claims by Holocaust deniers that the gas chambers which mainstream historians believe were for the massacre of civilians never existed, but rather that the structures identified as gas chambers actually served other purposes. These other purposes include cadaver storage, delousing, and disinfection. A similar argument is sometimes used that claims gas was not used to murder Jews and other victims, and that many gas chambers were also built after the war just for show. A document advancing this theory is the Leuchter report by Fred A. Leuchter, a paper stating that no traces of cyanide were found when he examined samples taken from one of the Auschwitz gas chambers in 1988. This is often cited as evidence that gas was not used in the chambers, as no trace amounts remain. Despite the difficulty of finding traces of this material 50 years later, in February, 1990, Professor Jan Markiewicz, Director of the Institute of Forensic Research in Kraków, redid the analysis. Markiewicz and his team used microdiffusion techniques to test for cyanide in samples from the suspected gas chambers, from delousing chambers, and from control areas elsewhere within Auschwitz. The control samples tested negative, while cyanide residue was found in high concentrations in the delousing chambers, and lower concentrations in the homicidal gas chambers. This is consistent with the amounts required to kill lice and humans. The search for cyanide in the bricks of buildings said to be gas chambers was important, because the pesticide Zyklon B would generate such a residue. This was the gas most often cited as the instrument of death for prisoners in the gas chambers, supported by both testimony and evidence collected of Nazi policy. Deniers have said for years that physical evidence is lacking because they have seen no holes in the roof of the Birkenau gas chamber where the Zyklon was poured in. (In some of the gas chambers the Zyklon B was poured in through the roof, while in others it was thrown in through the windows.) The roof was dynamited at war's end, and today lies broken in pieces, but three of the four original holes were positively identified in a recent paper. Their location in the concrete matches with eyewitness testimony, aerial photos from 1944, and a ground photo from 1943. The physical evidence shows unmistakably that the Zyklon holes were cast into the concrete when the building was constructed. The ruins of the Crematorium II gas chamber at Auschwitz-Birkenau. Leuchter's comment that the camp was "untouched" has been dismissed as nonsense by the Holocaust scholar Robert Jan van Pelt, who explains that the absence of most of the would-be rubble from the crematoria is because the local Polish population returning to the area after the war rebuilt farmhouses to the west with bricks salvaged from rubble in the camp area including from the Birkenau crematoria. Another piece of evidence Holocaust deniers frequently question is what happened to the ash after the bodies were cremated. The amount of ash produced in the cremation of a person is about a shoebox full, if done in a proper crematorium. However, eyewitness testimonies documented by Hilberg's The Destruction of the European Jews describe the burning process used in Treblinka, Sobibor, and Belzec to have carried out in multiple open-air grills where stacks of bodies were burned on top of metal bars. These grills were operated by burning piles of wood underneath. Cremation in the open at the Reinhard death camps (Treblinka, Sobibor and Belzec) was discussed at Nuremberg on the 7th April 1946 by Georg Konrad Morgen, SS judge and lawyer who investigated crimes committed in Nazi concentration camps. He stated: "The whole thing was like an assembly line. At the last stop they reached a big room, and were told that this was the bath. When the last one was in, the doors were shut and the gas was let into the room. As soon as death taken place in (sic), the ventilators were started. When the air was breathable, the doors were opened, and the Jewish workers removed the bodies. By means of a special process which Wirth had invented, they were burned in the open air without the use of fuel." There is well-documented evidence that other ash was used as fertilizer in nearby fields. Photographs of Treblinka taken by the camp commandant show what looks to be ash piles being distributed by steam shovels. Höss said in his confession that his men would smoke cigarettes as they pulled the dead Jews out of the gas chambers ten minutes after gassing. Isn't Zyklon-B explosive? Highly so. The Höss confession is obviously false." The Nizkor Project and other sources have stated that the minimal concentration of Zyklon-B to be explosive is 56,000 parts per million, while the amount used to kill a human is 300 parts per million, as is evidenced in "The Merck Index" and the "CRC Handbook of Chemistry and Physics". In fact, the Nazis' own documentation stated "Danger of explosion: 75 grams of HCN in 1 cubic meter of air. Normal application approx. 8–10 grams per cubic meter, therefore not explosive." The Institute for Historical Review publicly offered a reward of $50,000 for verifiable "proof that gas chambers for the purpose of killing human beings existed at or in Auschwitz." Mel Mermelstein, a survivor of Auschwitz, submitted his own testimony as proof but it was ignored. He then sued IHR in the United States and the case was subsequently settled for $50,000, plus $40,000 in damages for personal suffering. The court declared the statement that "Jews were gassed to death at the Auschwitz Concentration Camp in Poland during the summer of 1944" was a fact. The figure of "six million" (which refers only to Jewish victims, and is larger when counting the other ethnic, religious, and minority groups targeted for extinction) is often minimized by such claims to a figure of only 1 million deaths,[by whom?] or only 300,000 deaths. [by whom?] By contrast, the vast majority of scholars, institutions, and even Nazi officials estimate between five and six million Jews perished during the Holocaust, while some claim the number could possibly be even higher. With approximately 4.5 million Jewish victims' names collected by Yad Vashem, numerous documents and archives discovered after the war gave meticulous accounts of the exterminations that took place at the death camps (such as Auschwitz and Treblinka). The Nizkor project conducted a thorough research about this claim as well, and found the number of Jewish death to be at least 5.65 million. Deniers claim that these documents are based on Soviet propaganda, primarily from Ilya Ehrenburg's Jewish Anti-Fascist Committee, and are therefore unreliable. Complicating the matter is that various instances have been reported where the death tolls of particular death camps were claimed to be overstated. These claims vary in verifiability and objectivity. A much-quoted instance of disputing the toll is the "Breitbard Document" (actually a paper by Aaron Breitbart), which describes a commemorative plaque at Auschwitz to the victims that died there, which read, Four million people suffered and died here at the hands of the Nazi murderers between the years 1940 and 1945. In 1990, a new plaque replaced the old one. It now says, May this place where the Nazis assassinated 1,500,000 men, women and children, a majority of them Jews from diverse European countries, be forever for mankind a cry of despair and of warning. The lower numbers are due to the fact that the Soviets "purposely overstated the number of non-Jewish casualties at Auschwitz-Birkenau," according to the Simon Wiesenthal Center. Holocaust deniers insist that the number of Jews killed therefore be lowered by at least 2.5 million. However, the plaque had never been used as an accurate historical source by mainstream historians. As early as the 1950s, Raul Hillberg estimated 1.1 million Jewish deaths in Auschwitz. Holocaust deniers argue that the multiple pre-World War II claims of precisely six million Jews facing extermination, like former New York Governor Martin Glynn's 1919 article "The Crucifixion of Jews Must Stop! ", suggests the reported death toll is inaccurate and was invented to fit propaganda. Historian Robert N. Proctor has criticized such claims stating "[this] oddity has been exploited by Holocaust deniers but is simply a remarkable coincidence and nothing more". Holocaust deniers misrepresent and omit information contained in ICRC reports that contradict their claims. Critics argue that Richard Harwood in his "Did Six Million Really Die?" pamphlet could only claim that the ICRC had found no evidence of a policy to exterminate Jews by ignoring key sections of the 1948 report, where the ICRC explicitly states that the systematic extermination of Jews was Nazi policy. Harwood disputed the notion that homicidal gas chambers were disguised as shower facilities by citing references in the report where ICRC officials inspected bathing facilities. He used their responses to argue that showers functioned as showers and were not part of a killing installation. However this is considered misrepresentation by critics, as the passage Harwood cited is in reference to Allied camps for civilians in Egypt and thus had nothing to do with Nazi concentration camps. A letter from the Sonderstandesamt (special registry office) at Bad Arolsen regarding only deaths at Nazi concentration camps that were registered by this institution (not to be confused with the numbers of deaths officially registered in the camps themselves). This and similar correspondence is frequently misrepresented as the absolute death toll of the Holocaust by deniers. Note that the English translations are not a part of the original document and are incorrect: the document does not come from the Red Cross. "Anzahl" means "count", "number" and not "Total Deaths". Harwood also claimed that Die Tat, a Swiss tabloid newspaper, published statistics that concluded the number of people who died in Nazi prisons and camps from 1939 to 1945 based on ICRC statistics was "300,000, not all of whom were Jews". The January 19, 1955 edition of Die Tat did indeed give a 300,000 figure, but this was only in reference to "Germans and German Jews" and not nationals of other countries. In the 1978 official bulletin, entitled "False Propaganda", the ICRC denounced Holocaust denial and confirmed that the agency "Never published—or even compiled—statistics of this kind which are being falsely attributed to it" and stated that its mission was "to help war victims, not to count them", and questioned how they would have even been able to obtain such statistics had they wanted to, given that they were "only able to enter only a few concentration camps...in the final days of the war". The agency states that the figures used are "the number of deaths recorded by the International Tracing Service on the basis of documents found when the camps were closed", and accordingly bear no relation to the total death tolls, since the Nazis destroyed much documentation, and that many deaths occurred in camps where prisoners were generally not registered. The ICRC considers this misrepresentation as "propaganda", and because these claims regarding the ICRC were used for the defense of Ernst Zündel at his trial in 1985, critics state that despite the agency's attempts to demonstrate the truth, Holocaust deniers have continued to rely on ICRC based disinformation. Archives of the International Tracing Service (located in Bad Arolsen) responding to such misrepresentation can be found here. In 1979, the ICRC stated a second time that they have "never tried to compile statistics on the victims of the war", nor "certified the accuracy of the statistics produced by a third party", and state that the authors of such material have "falsified" both claims that the document originates from the ICRC and refers exclusively to Jews. The figures cited by the author of the booklet are based upon statistics falsely attributed to us, evidently for the purpose of giving them credibility, despite the fact that we never publish information of this kind. —  Françoise Perret, Comité International de la Croix-Rouge, to Jacob Gerwitz, August 22, 1975. Similarly, Harwood wrote that the June 4, 1946 edition of Baseler Nachrichten, another Swiss newspaper, reported that "a maximum of only one and a half million Jews could be numbered as casualties." Harwood fails to mention that a later article in a later edition of the newspaper acknowledges that the previous article was incorrect, and 5,800,000 was an accurate number of victims. Critics cite this as an example of deniers using partial information to distort legitimate sources. Only in 1949 are postwar estimates employed, the figures given are for estimates made in 1948. A year or two lag seems to be common for various other population estimates given by the World Almanac. The difference between the 1938 and 1948 figures is thus 4,481,491. In 1949, however, the World Almanac gives a revised 1939 population of 16,643,120 giving a difference of between 1938 and 1947 of 5,376,520. Where the extra population between 1938 and 1939 came from is not cited, though one might speculate that it was based upon the Nazi estimates made in 1942 for the Wannsee Conference. Despite the apparent exactness of the numbers listed, the World Almanac warns that all numbers listed are estimates. Other sources confirm similar numbers—and earlier than the 1949 World Almanac—for the Jewish population before and after the war. The 1932 American Jewish Yearbook estimate the total number of Jews in the world at 15,192,218, of whom 9,418,248 resided in Europe. However, the 1947 yearbook states: "Estimates of the world Jewish population have been assembled by the American Jewish Joint Distribution Committee (except for the United States and Canada) and are probably the most authentic available at the present time. The figures reveal that the total Jewish population of the world has decreased by one-third from about 16,600,000 in 1939 to about 11,000,000 in 1946 as the result of the annihilation by the Nazis of more than five and a half million European Jews. In Europe only an estimated 3,642,000 remain of the total Jewish pre-war population of approximately 9,740,000." These numbers are also consistent with the findings of the Anglo-American Committee of Inquiry, Appendix III, in 1946. The Nazis used figures of between 9 and 11 million for the Jewish population of Europe, as evidenced in the notes of the Wannsee Conference. In fact, the Nazis methodically recorded the ongoing reduction of the Jewish population, as in the Korherr Report, which gave the status of the Final Solution through December 1942. The Höfle Telegram was sent by SS-Sturmbannführer Hermann Höfle on January 11, 1943 to SS-Obersturmbannführer Adolf Eichmann in Berlin and detailed the number of deaths of Jews in the concentration camps. In the year 1942 alone, the telegram lists 1,274,166 Jews were exterminated in the four camps of Aktion Reinhard. The Korherr Report compiled by an SS statistician, gave a conservative total of 2,454,000 Jews deported to extermination camps or killed by the Einsatzgruppen. The complete status reports of the Einsatzgruppen death squads were found in the archives of the Gestapo when it was searched by the U.S. Army, and the accuracy attested to by the former Einsatzgruppen members who testified during war crime trials and at other times. These reports alone list an additional 1,500,000 or so murders during mass shootings, the vast majority of these victims were Jews. Further, surviving Nazi documentation spells out their plans to murder the Jews of Europe (see the Wannsee Conference), recorded the trains arriving at various death camps, and included photographs and films of many atrocities. Sonderkommandos provide another key piece of testimony. There were Jewish prisoners who helped march Jews to the gas chambers, and later dragged the bodies to the crematoria. Since they witnessed the entire process, their testimony is vital in confirming that the gas chambers were used for murderous purposes and the scale to which they were used. Other key testimony comes from non-Jewish survivors of the camps such as Catholic French Resistance member André Rogerie who was held in seven different camps, and who as a member of the Resistance was not targeted for extermination but for hard labor and survived. After the war Rogerie wrote and testified extensively about his experiences in the camps including Auschwitz-Birkenau where he viewed and produced the oldest contemporary sketch of a camp crematorium. Holocaust denial is generally viewed as antisemitic. Walter Reich, professor of international affairs at George Washington University and former director of the United States Holocaust Memorial Museum, stated, "The primary motivation for most deniers is anti-Semitism." The Encyclopedia of Genocide and Crimes Against Humanity describes Holocaust denial as "a new form of anti-Semitism, but one that hinges on age-old motifs." According to the Anti-Defamation League, "Holocaust denial is a contemporary form of the classic anti-Semitic doctrine of the evil, manipulative and threatening world Jewish conspiracy." French historian Valérie Igounet wrote, "Holocaust denial is a convenient polemical substitute for anti-semitism." In 2005, the European Monitoring Centre on Racism and Xenophobia published a working definition of antisemitism that included "denying the fact, scope, mechanisms (e.g. gas chambers) or intentionality of the genocide of the Jewish people at the hands of National Socialist Germany and its supporters and accomplices during World War II (the Holocaust)". Rainer Höss, grandson of Rudolf. ^ a b Donald L Niewyk, The Columbia Guide to the Holocaust, Columbia University Press, 2000, p.45: "The Holocaust is commonly defined as the murder of more than 5,000,000 Jews by the Germans in World War II." Estimates by scholars range from 5.1 million to 7.8 million. See appropriate section of the Holocaust article. "Before discussing how Holocaust denial constitutes a conspiracy theory, and how the theory is distinctly American, it is important to understand what is meant by the term "Holocaust denial." Holocaust deniers, or "revisionists," as they call themselves, question all three major points of definition of the Nazi Holocaust. First, they contend that, while mass murders of Jews did occur (although they dispute both the intentionality of such murders as well as the supposed deservedness of these killings), there was no official Nazi policy to murder Jews. Second, and perhaps most prominently, they contend that there were no homicidal gas chambers, particularly at Auschwitz-Birkenau, where mainstream historians believe over 1 million Jews were murdered, primarily in gas chambers. And third, Holocaust deniers contend that the death toll of European Jews during World War II was well below 6 million. Deniers float numbers anywhere between 300,000 and 1.5 million, as a general rule." Mathis, Andrew E. Holocaust Denial, a Definition Archived 2011-06-09 at the Wayback Machine, The Holocaust History Project, July 2, 2004. Retrieved December 18, 2006. "Among the untruths routinely promoted are the claims that no gas chambers existed at Auschwitz, that only 600,000 Jews were killed rather than six million, and that Hitler had no murderous intentions toward Jews or other groups persecuted by his government." Holocaust Denial Archived 2007-04-04 at the Wayback Machine, Anti-Defamation League, 2001. Retrieved June 28, 2007. The confessions of former Nazis to war crimes were extracted through torture." The nature of Holocaust denial: What is Holocaust denial? Archived July 18, 2011, at the Wayback Machine, JPR report #3, 2000. Retrieved December 18, 2006. ^ *"'Revisionism' is obliged to deviate from the standard methodology of historical pursuit because it seeks to mold facts to fit a preconceived result, it denies events that have been objectively and empirically proved to have occurred, and because it works backward from the conclusion to the facts, thus necessitating the distortion and manipulation of those facts where they differ from the preordained conclusion (which they almost always do). In short, "revisionism" denies something that demonstrably happened, through methodological dishonesty." McFee, Gordon. "Why 'Revisionism' Isn't" Archived 2010-04-28 at the Wayback Machine, The Holocaust History Project, May 15, 1999. Retrieved December 22, 2006. ^ Richard J. Evans (2002). Lying About Hitler: History, Holocaust, and the David Irving Trial. Basic Books. ISBN 978-0-465-02153-6. ^ "Holocaust denial - The IHR's Questions & Answers, and Nizkor's Responses". Nizkor Project. Retrieved 28 September 2013. ^ a b c d e "Debunking Denial : Hitler's Orders". Emory University. Retrieved 2016-10-13. ^ "Dokumente zum Nationalsozialismus : Hitlers "Gutachten zum Antisemitismus"" (in German). Ns-archiv.de. Retrieved 2014-03-22. ^ "BBC/OU Open2.net - History - Lecture transcript". Open2.net. Retrieved 2014-03-22. ^ Dawidowicz, Lucy S.; Altshuler, David A. (1978). Hitler's war against the Jews. Behrman House, Inc. p. 83. ISBN 978-0-87441-222-2. ^ Kaes, Anton; Jay, Martín; Dimendberg, Edward. (1995-11-14). The Weimar Republic sourcebook. University of California Press. p. 133. ISBN 978-0-520-06775-2. ^ "Adolf Hitler on the Jewish Question (Reichstag, 1939 January 30)". Holocaust-history.org. 1939-01-30. Archived from the original on 2008-03-14. Retrieved 2014-03-22. ^ Marrus, Michael (2000). The Holocaust in History. Toronto: Key Porter Books. p. 37. ISBN 978-0-299-23404-1. ^ "Adolf Hitler Speech at the Berlin Sportspalast, 30 January 1942". ^ "Nuremberg Trial Exhibit, 654-PS from". Nuremberg Trials Project. Retrieved 2017-07-21. ; English-language summary and analysis (John Buchsbaum): "HLSL Item No. : 2494 (19 September 1945)". Nuremberg Trials Project. Retrieved 2017-07-21. ^ "The Holocaust from". Channel4.com. Archived from the original on March 26, 2007. Retrieved 2014-03-22. ^ a b c Arad, Yitzhak (1984). "Operation Reinhard: Extermination Camps of Belzec, Sobibor and Treblinka" (PDF). Yad Vashem Studies. XVI: 205–239. ^ a b c Peter Longerich (15 April 2010). Holocaust: The Nazi Persecution and Murder of the Jews. OUP Oxford. p. 289. ISBN 978-0-19-280436-5. ^ "Nuremberg Trials Project, Document Number 365". Archived from the original on 2016-03-04. Retrieved 2017-11-07. ^ Thacker, Toby (2010) . Joseph Goebbels: Life and Death. New York: Palgrave Macmillan. p. 328. ISBN 978-0-230-27866-0. ^ "Goebbels diaries, the final entries"
^ "The Irving Quote". Nizkor.org. Retrieved 2014-03-22. ^ a b c d e McCarthy, Jamie. "Who is David Irving?". holocaust-history.org. San Antonio, Texas: The Holocaust History Project. Archived from the original on 5 September 2015. Retrieved 28 June 2015. ^ "David Cole's Letter". Nizkor.org. Retrieved 2014-03-22. ^ "The Trial of Adolf Eichmann, Session 104". Nizkor.org. Retrieved 2014-03-22. ^ "Letter to Irving, 8/9/96 (part 1)". Nizkor.org. 1996-08-09. Retrieved 2014-03-22. ^ Longerich, Peter. "Hitler's Role in the Persuection of the Jews by the Nazi Regime: Electronic Version". hdot.org. Druid Hills, Georgia: Emory University. Retrieved 13 October 2016. ^ Himmler, Heinrich. Speech to SS-Gruppenführer at Posen, Poland, October 4th, 1943. U.S. National Archives document 242.256, reel 2 of 3. ^ Ezard, John (17 February 2001). "Germans knew of Holocaust horror about death camps". The Guardian. Retrieved 16 November 2013. ^ Konnilyn G. Feig (1981). Hitler's death camps: the sanity of madness. Holmes & Meier. ISBN 978-0841906754. ^ "Proving the Gas Chambers & Crematoria". The Nizkor Project. Retrieved 16 November 2013. ^ "Syrian Holocaust Denial" by Mohammad Daoud, Syria Times September 6, 2000. Retrieved November 8, 2005. ^ "A Study of the Cyanide Compounds Content in the Walls of the Gas Chambers in the Former Auschwitz & Birkenau Concentration Camps". Nizkor.org. Retrieved 2014-03-22. ^ Goldhagen, Daniel (1996). Hitler's Willing Executioners: Ordinary Germans and the Holocaust. New York: Knopf. p. 157. ISBN 978-0-679-44695-8. ^ Hayes, Peter (2004). From Cooperation to Complicity: Degussa in the Third Reich. Cambridge; New York; Melbourne: Cambridge University Press. pp. 272–300. ISBN 978-0-521-78227-2. ^ in the words of Leuchter, "No holes — no Holocaust"
^ Morris, Errol (2006). "Mr. Death: Transcript". Retrieved 2008-08-07. ^ "Trials of German Major War Criminals: Volume 20". Nizkor.org. Retrieved 2014-03-22. ^ "Shofar FTP Archive File: camps/maidanek//maidanek.04". nizkor.org. Nizkor Project. 31 December 1994. Retrieved 24 May 2015. ^ "Appendix D - Ash Disposal and Mass Graves at Treblinka". The Holocaust History Project. Archived from the original on 2015-09-03. Retrieved 2015-04-16. ^ "Hoss said in his confession that his men would smoke cigarettes as they pulled the dead Jews out of the gas chambers ten minutes after gassing. Isn't Zyklon-B explosive?". nizkor.org. Nizkor Project. Retrieved 24 May 2015. ^ "Mel Mermelstein v. Institute for Historical Review Judgment and Statement of Record". Retrieved November 20, 2010. ^ "Answers to the 66 Questions of Holocaust Deniers". Jewishvirtuallibrary.org. Retrieved 2014-03-22. ^ "Mermelstein Victory", Heritage, October 23, 1981. ^ "Footnote to the Holocaust", Newsweek, October 19, 1981, p. 73. ^ LICHTBLAU, ERIC (March 1, 2013). "The Holocaust Just Got More Shocking". New York Times. Retrieved 9 September 2015. "The Horrifying New Holocaust Discoveries". October 18, 2013. Retrieved 8 November 2013. "French Priest Says Holocaust Death Toll Likely to Rise Following Investigation". Fox News. Archived from the original on 2016-01-27. Retrieved 9 September 2015. ^ "Central Database of Shoah Victims' Names". Yad Vashem. Retrieved 1 November 2018. "As of November 2018 the Central Database includes four and a half million names". ^ "Combating Holocaust Denial: Evidence Of The Holocaust Presented At Nuremberg". United States Holocaust Memorial Museum. Retrieved 8 November 2013. ^ "What proof exists that the Nazis practiced genocide or deliberately killed six million Jews?". Nizkor Project. Retrieved 3 December 2013. ^ Andrew Breitbart. "Responses to Revisionist Arguments". motlc.wiesenthal.com. Los Angeles: Simon Wiesenthal Center. Retrieved 10 January 2017. ^ Hilberg, R. Op. Cit. ^ Dawidowicz, L., The War Against the Jews. New York: Bantam Books, (1979) p. 191. ^ Hilberg, Raul (1961). The Destruction of the European Jews. New Haven; London: Yale University Press. p. 958. ISBN 978-0-300-09592-0. ^ Proctor, Robert N. (2000). The Nazi War on Cancer. Princeton University Press. p. 11. ^ a b Lipstadt, p. 117. ^ a b c d e ICRC Bulletin No. 25, Feb. 1, 1978, cited in Lipstadt, p. 117. ^ Kahn, Robert (2004). Holocaust Denial and the Law: A Comparative Study. London: Palgrave Macmillan. ISBN 9781403980502. Retrieved 28 June 2015. ^ a b c d e "Red cross exposure of "false propaganda"". Patterns of Prejudice. 12 (2): 11. January 1978. doi:10.1080/0031322X.1978.9969431. ISSN 0031-322X. ^ "Archives". Its-Arolsen.Org. Retrieved 2014-03-22. ^ a b c "Comite International De La Croix-Rouge". Nizkor.org. Retrieved 2014-03-22. ^ Suzman, Arthur; Diamond, Denis (1978). Six million did die: the truth shall prevail Arthur Suzman and Denis Diamond. South African Jewish Board of Deputies. p. 10. ISBN 978-0620031288. ^ Harwood, p. 14., cited in Lipstadt, p. 112. ^ Baseler Nachrichten, October 7, 1952; Aronsfeld, The Text of the Holocaust, p. 14., cited in Lipstadt, Denying the Holocaust. ^ "The World Almanac Gambit", Deceit & Misrepresentation: The Techniques of Holocaust Denial, Nizkor Project website. Retrieved December 6, 2009. ^ a b Hanyok, Robert (2004). "Eavesdropping on Hell: Historical Guide to Western Communications Intelligence and the Holocaust, 1939-1945" (PDF). p. 80. Retrieved 2007-09-09. ^ "How many People Died at Auschwitz" Archived May 21, 2011, at the Wayback Machine, by Franciszek Piper, Article Review, Memorial and Museum Auschwitz-Birkenau, Note 24: Hoess testimony, March 11, 1947, The proceedings of the Supreme National Tribunal in Warsaw. ^ How Reliable are the Hoss Memoirs? Archived 2012-04-29 at WebCite by John C. Zimmerman. Associate Professor, University of Nevada, Las Vegas. 11 February 1999. ^ "The Nizkor Project - Command staff". Nizkor.org. Retrieved 2014-03-22. ^ Annette Wieviorka, Déportation et génocide. Entre la mémoire et l’oubli, Plon, 1992, p. 249. ^ "Introduction: Denial as Anti-Semitism" Archived 2011-06-04 at the Wayback Machine, Holocaust Denial: An Online Guide to Exposing and Combating Anti-Semitic Propaganda, Anti-Defamation League website. Retrieved August 27, 2009. ^ Igounet, Valérie. "Holocaust denial is part of a strategy", Le Monde diplomatique, May, 1998. ^ "Working Definition of Antisemitism" (PDF). Archived from the original (PDF) on January 25, 2011. (33.8 KB), European Fundamental Rights Agency, 16 March 2005. Lipstadt, Deborah E. (1994). Denying the Holocaust: The Growing Assault on Truth and Memory (Pbk. ed.). New York, New York: Plume. ISBN 978-0452272743. Retrieved 9 July 2015. Lipstadt, Deborah E. (2006). History on Trial: My Day in Court with a Holocaust Denier (1st Harper Perennial ed.). New York: Harper Perennial. ISBN 9780060593773. Evans, Richard J. (2012). In Defence Of History. London: Granta Books. ISBN 9781847087904. Retrieved 9 July 2015. Evans, Richard J. (2002). Lying about Hitler : history, Holocaust, and the David Irving trial. New York: Basic Books. ISBN 9780465021536. Retrieved 9 July 2015. Kerr, Gordon (2000). The Irving Judgment: David Irving V. Penguin Books and Professor Deborah Lipstadt. London: Penguin Books. ISBN 9780140298994. Actual text of the judgment in the Irving case. Guttenplan, D. D. (2002). The Holocaust on trial (1st American ed.). New York: W. W. Norton & Company. ISBN 9780393322927. Niewyk, Donald (2009). The Holocaust: Problems and Perspectives of Interpretationof interpretation (4th ed.). Boston: Cengage Learning. ISBN 9780547189468. Pelt, Robert Jan van (2002). The Case for Auschwitz: Evidence from the Irving Trial. Bloomington, Indiana: Indiana University Press. ISBN 9780253340160. Retrieved 9 July 2015. Shermer, Michael; Grobman, Alex; Hertzberg, Arthur (2009). Denying History: Who Says the Holocaust Never Happened and Why Do They Say It?. Oakland, California: University of California Press. ISBN 9780520944091. Retrieved 9 July 2015. Zimmerman, John C. (2000). Holocaust Denial: Demographics, Testimonies and Ideologies. Lanham, Maryland: University Press of America. ISBN 9780761818229. Hilberg, Raul (2003). The Destruction of the European Jews. New Haven, Connecticut: Yale University Press. ISBN 9780300095579. Nicholas Terry, Roberto Muehlenkamp, Jason Myers, and Jonathan Harrison (2012). Belzec, Sobibor, Treblinka: Holocaust Denial and Operation Reinhard: A Critique of the Falsehoods of Mattagno, Graf, and Kues. Holocaust Controversies. Book Length Analysis of Holocaust Deniers' Views of Operation Reinhard. Rubenstein, Richard L.; Roth, John K. (2003). Approaches to Auschwitz, Revised Edition: The Holocaust and Its Legacy. Louisville, Kentucky: Westminster John Knox. ISBN 9781611642148. Retrieved 9 July 2015. Hayes, Peter; Roth, John K. (2010). The Oxford Handbook of Holocaust Studies (1st pbk ed.). Oxford: Oxford University Press. ISBN 9780199211869. Retrieved 9 July 2015. Hirsh, David (2003). Law Against Genocide: Cosmopolitan Trials. Singapore: Marshall Cavendish. ISBN 9781843145073. Retrieved 9 July 2015. Wistrich, Robert Solomon (2012). Holocaust Denial: The Politics of Perfidy. Berlin: Walter de Gruyter & Co. ISBN 9783110288216. Retrieved 9 July 2015. Atkins, Stephen E. (2009). Holocaust denial as an international movement. Santa Barbara, California: ABC-CLIO. ISBN 9780313345388. Retrieved 9 July 2015. Stern, Kenneth S. (1993). Holocaust denial (3rd printing. ed.). New York: American Jewish Committee. ISBN 9780874951028.